This article is about a fortress. 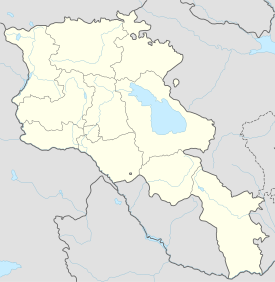 For the Armenian dialect, see Kakavaberd dialect. For the village, see Kakavaberd, Ararat. No. One must ask permission to enter the reserve. Large sections of fortification walls are well preserved. 4th century?, first mentioned in the 9th-10th centuries. Kakavaberd or Kaqavaberd (Armenian: Կաքավաբերդ; also known as Geghi Berd, Keghi Berd or Kegh (Armenian: Գեղի բերդ) is a fortress on a ridge overlooking the Azat River gorge at the Khosrov State Reserve in the Ararat Province of Armenia. Kakavaberd is 1,516 metres (4,974 ft) above sea level. The fortified walls of Kakavaberd are well preserved and crown a ridge within the Khosrov State Reserve. It is inaccessible from three of its sides because of the steep terrain. Towers at the northeastern side are 8 to 10 metres (26 to 33 ft) tall. Within the fortress are the ruins of a church and other structures. In the 11th century it passed over to the Pahlavuni family, and in the 12th–13th century to the Proshyan family for whom the nearby town is named. Kakavaberd was last mentioned in the year 1224 when after losing a battle that took place near Garni, Ivane Mkhargrdzeli found shelter there. Brady Kiesling, Rediscovering Armenia, p. 53; original archived at Archive.org, and current version online on Armeniapedia.org. Wikimedia Commons has media related to Kakavaberd. This page was last edited on 14 July 2018, at 21:53 (UTC).